In the past, I posted about sliding Facebook Followers Box For Blogger. In this article, I will provide you with an attractive Google+ followers sliding box for Blogger Blogs. This Google plus follower widget is just like Facebook Like Box and Twitter Fan Box. 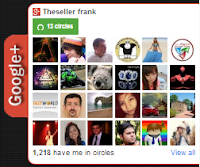 Sliding Google+ followers box will float on your blog/websites’ left or right side. When the mouse hovers it will animate by sliding the left. Once the widget is installed on your blog, your visitors will be shown a sliding out box. One of the best ways to increase your Social fans is to add the jQuery Pop-up Social Box to your Blog. Once this widget is installed on your blog, your visitors will be shown a slide out box with the option to like your Facebook Page, or want to follow on Twitter, or want to add you in there Google+ circle, want to subscribe your feedburner email whenever they visit your blog. A great advantage of this widget is to save spaces on your page. You’ve got to have this on your blog especially if there are so many things that you would like to put on your blog such as advertisements and other widgets. Make every space of your blog count. Replace https://plus.google.com/107867892077506204798 with your Google+ Profile URL. Google is already offered a Google+ followers box for your blog/website, but i think it's need a large space for it, so by adding this sliding widget we don't need waste space of your sidebar. Sliding Google+ followers box will float on your blog/website. and when the mouse over, it will animate by sliding to left. I've seen those sliding boxes and I do kind of like them!! Thank you for sharing how to create one!